Free entry. Book early. Limited space availability. 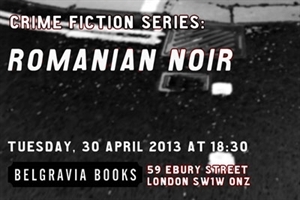 "Belgravia Books is pleased to partner with Profusion Publishers (www.profusion.org.uk) for this event. Ramona Mitrica from Profusion and author Mike Phillips will guide you through a fascinating literary world you never thought existed. They are responsible of bringing to Britain a never-before-seen glimpse of Romania, with a series of Romanian noir with a difference: novels that certainly thrill, but also books which can show the audience the reality of a country which used to be behind the Iron Curtain but now emerges as a vibrant European partner after a bloody revolution and a long transition to a market-economy."